Today my very good friend Jenn and I crossed the LaHave River with our babes to enjoy the Lunenburg Farmer’s Market. Jenn is one of my favourite food excursion companions – we both love to eat and we get excited about the same things. Today it was inoculated mushroom logs and some beautiful radicchio that hardly resemble the uptight looking purple stuff from the grocery store. I picked up an excellent baguette (wheat is such a treat since I use only spelt at home) and some soft garlic herb goat cheese, which Eleanor and I enjoyed immediately. We tore off hunks of bread and scooped up the cheese, pretending it was a traveller’s picnic while listening to a group speaking German over their market breakfast. I also treated myself to a walnut, date, & coconut macaroon for a dollar and then spent another dollar on a single Honeycrisp apple for Eleanor. Where to spend the rest of our allotted dollars? 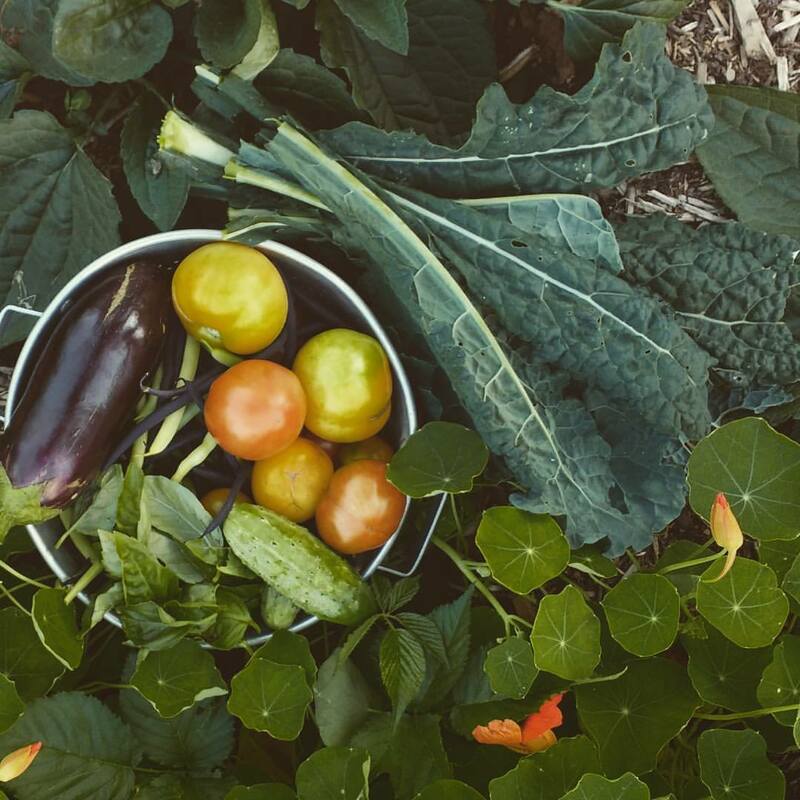 There was no Goat’s Milk or Kefir to be had and still mostly greens at the farm stands this week, which I thankfully have a garden full of. Jenn picked up some tart cider and oat cakes to share and we each chose some happy beef from Kurt at Wooly Mountain Farm. Then we honed in on Evan’s table full of blue coolers – more specifically, the one labelled Ocean Trout. It was incredibly fresh and gorgeous. Sold. 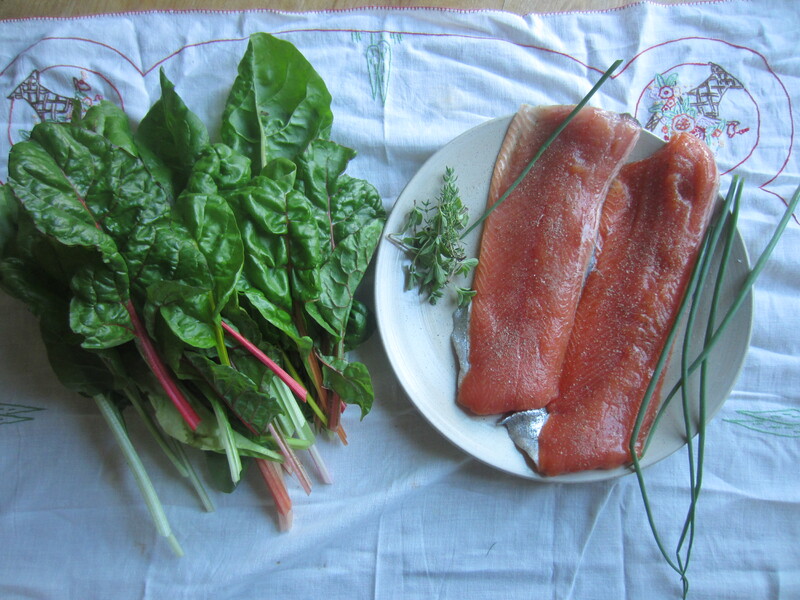 Arriving home, I cut a few bunches of rainbow chard from the garden – one for each of us. Finally, baby and pet routines pulling us home, we went our separate ways to make nearly identical suppers. 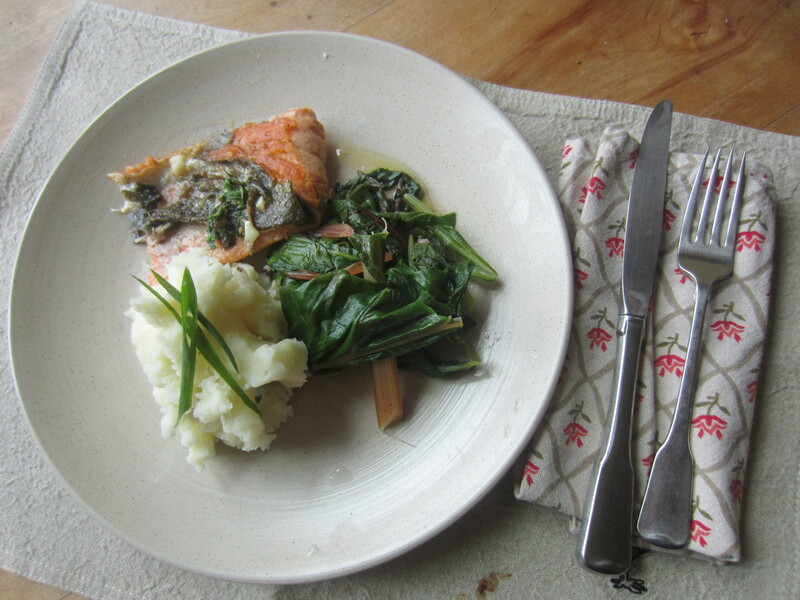 Pan fried Trout with thyme butter, garlic potato mash and steamed chard with chive blossom vinegar. Absolute heaven. 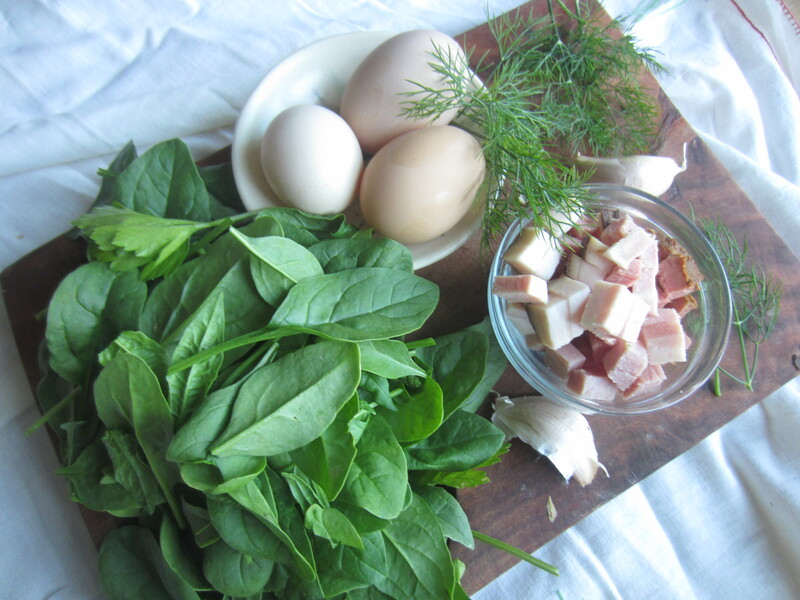 I had a surplus of eggs, smoked bacon, cheese, spinach that was bolting and a few herbs, so I also threw together some crustless quiche for snacks. They’re still cooling. Can I please cram just one more plate of food into this post? How about this for a brunch? 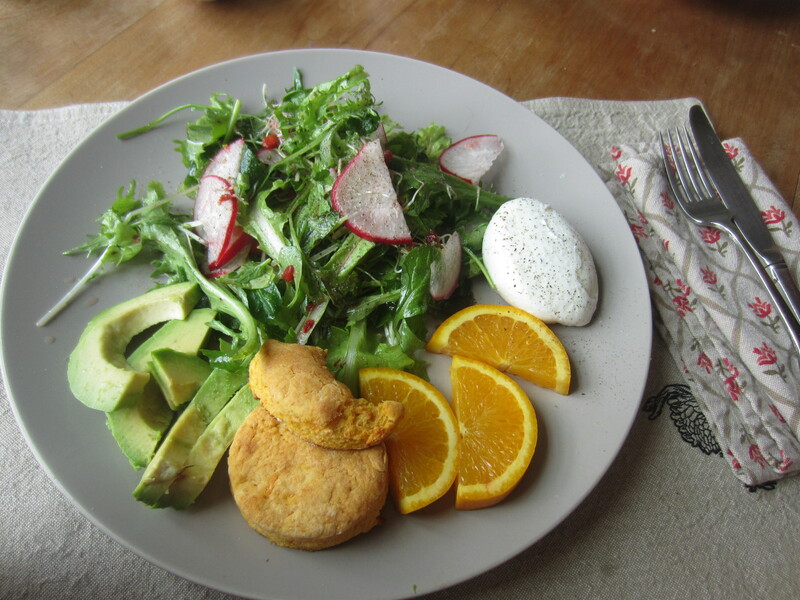 Garden Asian greens with radish and a strawberry ginger vinaigrette, poached egg, sweet potato biscuits (a morning treat delivered by my sweet neighbour with currant & blackberry port jam! ), avocado, and orange. This was Canada Day. If you are willing to share your technique for poaching the most beautiful eggs on the internet, please do! Also, I *love* the meal posts…keep them coming! Just enough water to cover the egg; a bit of vingear in the gently simmering water; crack egg first into a small bowl and very slowly and gently slide it into the water so the whites begin to congeal as you go. then use a slotted spoon to gently turn it once through cooking and remove it. Easy peasy.